A cruel twist of fate changed Simon Blackwell's life irreparably. A man of intense passions, he resolved to deny his emotions and desires forever, taking refuge in the wilds of the moorlands and shutting himself off from the world. But on one extraordinary night, on a rare trip to London, the unthinkable occurs. An intoxicatingly beautiful stranger stirs the sensuous hunger he has sworn to resist. Simon Blackwell believed that no woman could tempt him.No woman . . . save Annabel McBride.Annabel knows nothing of Simon's secret pain. But one irresistible kiss plunges her into marriage with a man she scarcely knows, a man who hides a shattered past. 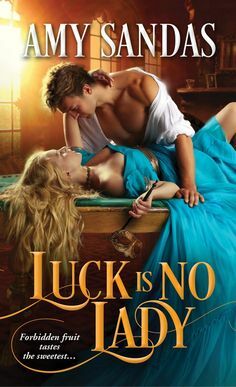 She can feel the blistering heat of the fire that smolders within this exquisitely handsome man, making her yearn for much more than the union in name only he has promised her.But Simon dares not love again—for fragile love can be lost in an instant. And now Annabel must find a way to open his heart to the most glorious risk of all . . .
Annabel McBride has always longed for the love and passion that she has seen within in her own family, and children of her own. When a almost accident puts Simon Blackwell in her path, she doesn’t know if she should run away or draw closer. After sharing a passionate embrace and then having to be married when caught, Annabel hopes that she will be loved in this marriage, however all her hopes are dashed when it is more than obvious that Simon has no intention of sharing a bed with her let alone a lifetime. Simon after having a tragic past and losing most of whom he loved, is hesitant to be in love once more, and if he lost Annabel he knows he could never go through it a second time. So he goes about trying to avoid her, but her influence is everywhere on his estate, and when Annabel goes about to seduce her own husband, Simon knows he doesn’t stand a chance, and when they both find a heightened desire and passion, the rulebook that Simon has placed on their marriage goes out the window, and true love will be replaced. I found that even though I enjoyed reading Annabel’s story, the first half of the book seemed to go very slow and there were times that I had a hard time getting through it. I have read many books of Samantha James and thought that this one I could get through easily, but I was wrong. I mean once it reached a certain point I could hardly put it down, however it was reaching that point that was the problem. I don’t kow if it was me or the way the story was written, but that was a big issue for me. But I still recommend reading this book, it was a great read, and I am glad that I did read it. This is a fun series to read, so I do recommend reading it. Growing up in Joliet, Illinois, Samantha James had many childhood aspirations--being a writer was never one of them. When she was ten, she was certain she was destined to be an astronomer. That soon changed (happened a lot during those pre-teen years!) when she decided archaeology was in her future. Detective work was her next goal, thanks to the Trixie Belden mysteries she was reading, and before long, nursing beckoned (courtesy of the Cherry Ames series). In college, she set her sights on teaching history, then briefly entertained the notion of becoming a flight attendant, only to discover she did not like to fly. Having been raised in a family of avid readers, she was rarely without a book in hand. Her tastes were rather eclectic. She got hooked on the Doc Savage series and Edgar Rice Burroughs after her older brother finished them, in her teen years, moved on to Agatha Christie, Daphne DuMaurier, and Phyllis A. Whitney. In the meantime, the right guy came along. They met on a semi-blind date at an office Christmas party. She was told he wanted to go out with her, and he was told she wanted to go out with him. Six months later, the U.S. Army shipped him off to Germany--and she wrote faithfully at least three times a week--she often jokes this was the start of her writing career! Marriage followed, as well as three daughters. Samantha left the detective work to her husband and turned her attention to raising their girls. When her youngest was six months old, two things happened: 1) she read Moonstruck Madness by Laurie McBain and scrambled to find every historical romance she could lay her hands on; 2) her older brother revealed he was writing and submitting his short stories to big-name magazines. As he put it, "I've been rejected by the best of 'em." The seed was planted. Rejection was a dreaded word, but Samantha figured, "Well, if he can take it, so can I." That summer, she wrote not one book, but three--longhand, in a notebook, during naptime. Bedtime. Any time she could. The burning desire to write was a long time in coming--she was nearing thirty by then--but she discovered that once she set pen to paper, she couldn't stop. To date, her books have been published in numerous foreign countries (her daughters' number one choice for show-and-tell were always the foreign editions of Mom's books). Known for her heartfelt, emotionally charged "three-hanky reads", her books have been nominated for numerous awards, and have consistently hit the bestseller lists.